The built-in handle and strong, durable stocks makes transporting heavier products like bottled food and beverages easier. Increase brand and company recognition by printing the name of your product or company on your box with eye-catching graphics. With full color printing and premium durable stocks, we guarantee that your rectangular handle boxes will make an exceptional impression. The optional built-in handle is sturdy and allows for convenient carrying of your desired contents. Strong, durable stocks protect the enclosed items from damage, even in transit, making them the perfect accessory for packing and transporting breakable items. Choose from our two premium card stocks to suit your needs. For a natural look, our 14 pt uncoated card stock is economic at our lowest prices. For added gloss and elegance, select our durable 18 pt coated card stock. You can decorate your wine bottles with hang tag die-cut hole printing; you can label it with your name and logo. We guarantee to deliver top-quality printed materials for any of your packaging needs. These rectangular boxes are extremely versatile – use them for packing retail food items or gifting candy, to storing personal items. Whatever their use, our low cost boxes are attractive and great for making an elegant presentation with premium, thick stocks and bright, full color graphics. 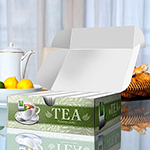 Also try our custom made rectangular box packaging printing for bottles, products, or gifts. Our boxes are made with strong, durable stocks to enclose and prevent damage to any of your items. With their high durability, folder boxes are extremely cost-effective marketing materials to advertise your company or brand. The heavy-duty materials can hold many different items including wine bottles and other condiments. Assembly is easy; simply fold your boxes along the designated folds and seal with the bottom adhesive strip. Package your products and increase brand recognition with an outstanding design, or amaze gift recipients with a beautiful box that can be reused again and again. The box will arrive with a built-in handle for easy transport. The box will arrive with a tuck-flap closure and no built-in handle. Impress and attract attention with a well-designed, custom rectangular box with a built-in handle! These boxes are ideal for packing retail products and promotional items while making a powerful impact on customers. 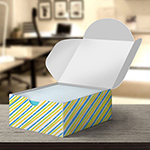 With a unique design, rectangular boxes can increase brand or company recognition, and customers will appreciate that they can store their products in style. Brand recognition makes your company memorable, and providing exceptionally presented promotional items will increase your reputation and business. If you sell homemade products, from beverages to jam and fresh baked cookies, your customers value that you can offer something that large retail stores do not. Offer them packaging that is as unique as your product is with custom designed rectangular boxes. These boxes along with your homemade products make for a truly exceptional gift at the convenience of your customers. We offer low-cost wholesale quantities so that even large retail stores can package their items in a stylish way. Custom rectangular boxes, when designed well, will attract attention to any products and increase sales. Printing your company name or logo in stunning full color will increase brand recognition of your company and make you memorable. Our rectangular boxes are the perfect way to package gifts or party favors for large events. Present each guest with a bottle of wine or candy exquisitely packed in a full-color carrying box, and they will appreciate something so conveniently portable that can be re-used again and again. The heavy-duty card stocks and self-adhesive bottom closure will securely contain your contents and prevent damage. These exceptional rectangular handle boxes will surely make a powerful impact and leave a lasting impression. Rectangle handle boxes are extremely versatile and portable; use them for carrying office supplies and beverages, to storing just about anything! 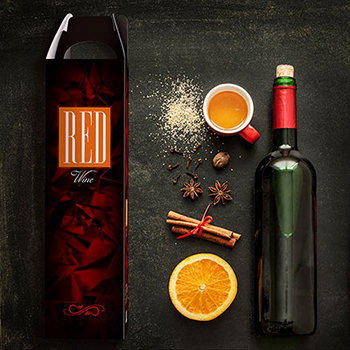 Our high-resolution, full-color printing will make the graphics and design for your rectangle handle boxes stand out beautifully. The handle is strong, not flimsy like I thought. I am very impressed with how my graphics turned out. Excellent job! These boxes turned out great,, i love them! With Handle The box will arrive with a built-in handle for easy transport. With Top Flap Closure/No Handle The box will arrive with a tuck-flap closure and no built-in handle.